Purchased by the current owners in 1979. L'Art Décoratif, vol. VII, January - June 1905, p. 259. A. Duncan, Paris Salons, vol. III, Woodbridge, 1996, p. 42. Salon de l'Art Décorafits, Paris, 1905. Born in Geneva, Angst studied under sculptor Jean Dampt in Paris from 1895. His subsequent work, exhibited shortly after this apprenticeship, was critically acclaimed as it followed a development away from over-elaborate ornamentation to a cleaner and more considered form of Art Nouveau. Very few works by Angst are documented apart a small number of sculptural pieces. 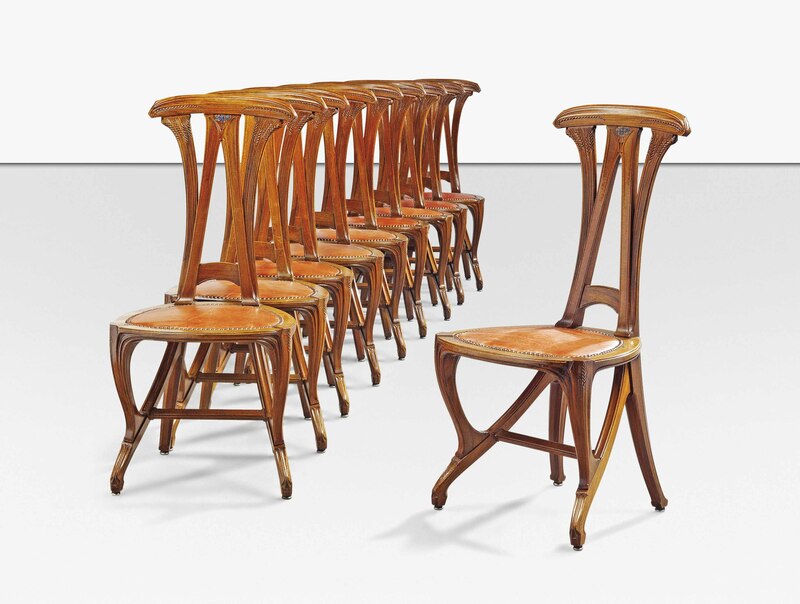 The present pieces, featured in a key exhibition at the very height of the Art Nouveau movement, constitute the only full suite of his furniture currently recorded.